We support and train individual advocates. Everyone should have the opportunity to live in a safe, healthy, affordable home. Unfortunately, many people all over Washington have stories of denied opportunity, housing instability, and how poor policies have contributed to homelessness. No one can tell these stories like someone who's lived it. The Housing Alliance supports people who have experienced homelessness or housing instability in advocating for positive policy change. 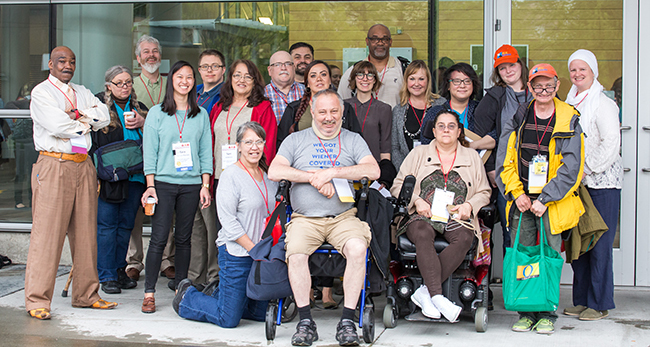 Emerging Advocates and Resident Action Project members at the 2017 Conference on Ending homelessness in Tacoma. Advocacy skills are easy to learn. The Emerging Advocates Program provides people who have experienced homelessness or housing instability with training and support to effectively make their voices heard in an advocacy context, while developing skills helpful in any environment. The Emerging Advocates Program offers: an on-the-ground introduction to the state capitol and the basics of the legislative process, deeper knowledge of key issues, support in developing your advocacy messages, experience contacting legislators, connections to the affordable housing and homelessness advocacy movement, and other opportunities depending on each advocate’s interests. *We currently have capacity to work with up to 10 Emerging Advocates at a time on their initial skillset development. If there are already 10 active participants when you apply and you meet the program criteria, you can sign up to be contacted once there’s an opening. Priority will be given to individuals with personal experience of homelessness who are interested in engaging in legislative advocacy at the state level. “I’ve realized that I’m an expert on poverty and homelessness because I’ve been there." Matthew Anderson, EAP graduate, leading a workshop on Housing and Homelessness issues.